Since then, I’d like to say that I can call the people I met at my first SourceCon, my friends and I’m super excited to be seeing them all again in just a few days. That is exactly what you should do if this is your first time attending SourceCon. Break out of your comfort zone and talk to people. Introduce yourself to those who you’ve been following on Twitter. This is your opportunity to learn from some of the best sourcers as well as share your knowledge with others. It’s easier than ever – you are not alone! We have the Welcome Wagon. 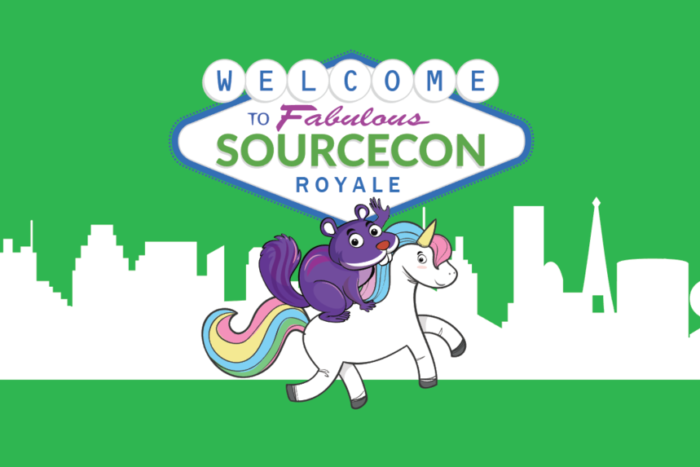 The Welcome Wagon will be your first stop when checking in to SourceCon. Primarily run by @LevyRecruits aka Steve Levy aka #UncleSteve, there is a group of Welcome Wagoners who will go out of their way to make you feel at home. The list is too long to name them all, but look for matching shirts, purple shoes, purple hair, unicorn horns, whatever. You’ll definitely know when you run into somebody from the Welcome Wagon. Now, let’s talk about my SourceCon strategy (I’m a little nerdy like that) – and certainly feel free to do the same. My strategy when attending SourceCon is to try and plan ahead of time of what I want to take away and who I want to meet. Of course, it’s fun to see old sourcing friends and meet new ones, but I also want to learn. And, believe me – there is so much information that will be shared, you have to figure out a way to try and take it all in. Take notes, take pictures, tweet, whatever works for you. If you haven’t started following and tweeting using the hashtag #SourceCon, do it now. After all, sharing is caring. You’ll also learn more about that if you meet @ohsusannamarie. Follow #SourceSmarter to learn more. Next, if you haven’t done so already, make sure you download the free SourceCon mobile app by Whova. It’s like Facebook for SourceCon – you can view the agenda and plan your schedule, post and read messages, plan ahead whom to meet (this is my favorite), send messages & exchange contact information, maps, parking, and so much more. I always spend some time on the app prior to the event and make a list of people that I want to meet. When you arrive in Vegas, check-in via Facebook or Twitter and let people know you’ve arrived (unless you believe what happens in Vegas stays in Vegas). Don’t forget to use the hashtag #SourceCon. It goes without saying that you must attend the sessions. Use the app to pick those that are of interest to you. And, of course, make sure you attend the keynotes. There are many breaks throughout the day including lunch and networking events. Take the time to meet new people and socialize. Stop by the innovation lab and visit with vendors to learn about new tools and technology. I remember my first time talking to vendors – a few lads from Ireland wearing green ninja shirts. They’re my Irish pals now! And don’t forget about the hackathon! I have to say that was the highlight of my last two SourceCons. Why? Because I was the winner. No, just kidding. But, I sat with the winners. I competed against the best of the best. I got the scoop on the latest and greatest tools, new chrome extensions, list scraping hacks, and so much more. And it was fun. You don’t want to miss it! Finally, Shannon Pritchett – BIG thank you. Thank you for all that you do for our community. Thank you for welcoming me to the SourceCon family. I will win the hackathon one of these days, for real. See you next week at SourceCon!